A collection of interviews with grown unschoolers, both on this blog and on other sites. 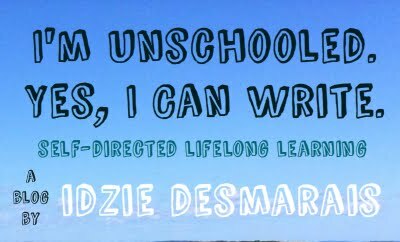 If you're a grown unschooler who'd like to answer a few questions about your unschooling journey, please find out more about how to do so here. I'd love to hear about your experiences! Hannah Thompson: "My unschooling experience has taught me to follow my passion without restraint." Anna J. Cook: "The experience of unschooling helped me to remain confident in myself." Cheyenne La Vallee: "Everyone has it in themselves to be passionate and motivated." Jaclyn Dolamore: "Art and stories are woven through the fabric of every subject." Jasmine Carlson: "You don't feel pressured to 'be' something, you are allowed the space and time to create." Vanessa Wilson: "As an unschooled kid, the world is full of so much that a school cannot give." Tara Wagner: "Amazing things happen inside of freedom." Chloe Anne Spinnanger: "The best thing about unschooling is freedom!" C. Kennedy: "I was unschooled from the day I was born." Unschooler Jessica Barker: "Redefining success." If you know of other interviews with grown (17 or older) unschoolers not listed here, please pass the link along to me! Thank you. Thanks Idzie for including Radio Free School interviews. We also have Kate Cayley's interview (Looking back on unschooling) http://radiofreeschool.blogspot.com/2009/02/skipping-school.html. Also, there are other interviews I've done on the blog if you search under higher education without a high school. I am 23 and was unschooled until I chose to go to public school at age 12, and subsequently dropped out at 16. After reading all of these interviews I feel terribly isolated in the fact that I did not have as positive an experience as everyone else seems to have. I was miserable at home and out of place at school. I now have a GED, no college education, and two little girls...and I feel lost. Is there anyone else out there like me? I am 23 I left high school.at 18 and I have two boys! LOL. However I am not unschooled and I have no type of deploma. I left school because I always hated it. I didn't like being confined to learning certain subjects and felt like a failure when I didn't pass test. I think you need to look within yourself and look for what you love doing. Art music writting! You need to have faith in yourself! Self motivation can drive you to do amazing things!